Designed with precut 2 1/2" strips in mind, this is a colorful way to create a complete "tablescape": table runner, place mats, and even mug rugs (some people call them "coasters" but we like to be different around here). 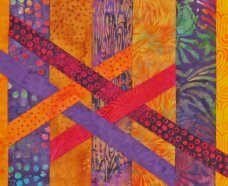 The criss-crossing tubes are sewn but not quilted to the backing, giving it an unusual 3-D effect (fabrics: Island Batik). 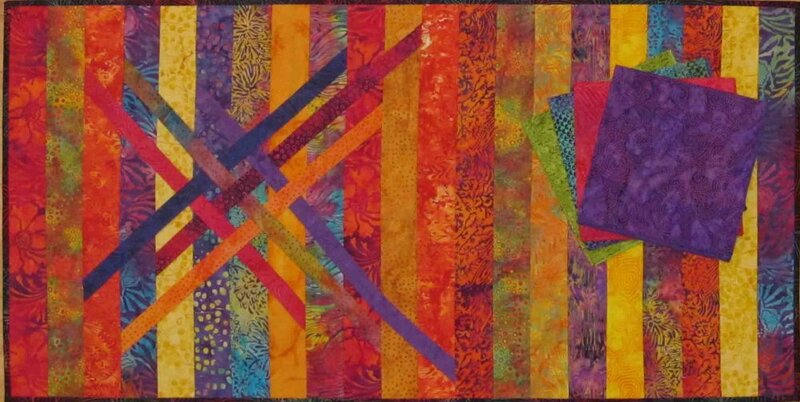 And to make this project simpler... it is self-quilting! The strips are sewn in place onto the assembled quilt sandwich. This is a great weekend project or shop class. Notice that the place mat is done slightly different. Instructions for this version are also included in the pattern. table runner: 19 1/2" x 36 1/2"
place mat: 20 1/2" x 15 1/2"
mug rug: 4 1/2" x 4 1/2"